Refrigerator management is something we care about here at Recipeer.com. 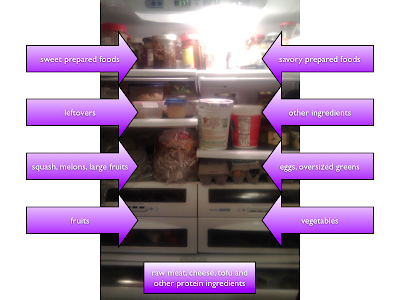 Lear more with great refrigerator management tips in our blog index. One simple thing you can do to keep your refrigerator in order is designate sections of the refrigerator for fresh/raw, cooked/leftovers, and pre-prepared items. I also suggest designating these areas so they progress in one direction. For instance when the crisper drawers are on the lowest level you might designate the bottom of the refrigerator as the fresh/raw section, the middle height shelves for cooked foods and the top shelves for prepared foods. If one of these categories is as big as the other two combined you might split the refrigerator in half and keep the largest category in one half while the other two categories split the other half top to bottom. 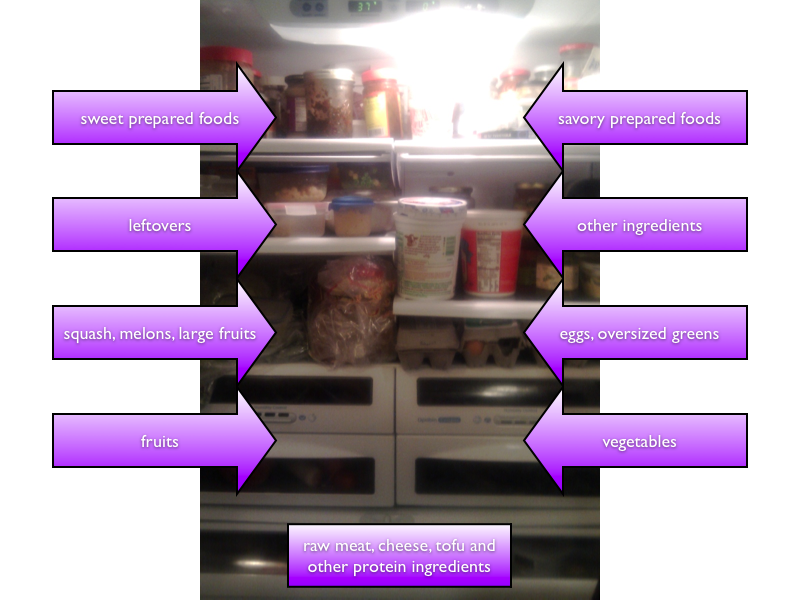 However you lay it out (I suggest taking a digital picture of the open refrigerator and printing it out on regular paper so you can draw on it and not get cold), the important thing is to stick to the plan. Here's mine for instance. It's always tempting to cheat the leftovers into the raw ingredients, but it is much better to do something with the oldest leftovers to make space for the new ones. The most precise organizers will label leftovers with the date they expect them to expire, so they know what to reuse/dump first, but you could get most of the way there by something as simple as storing the oldest items on the left of the leftover section and shifting everything over to the left when you add something new to the section. UP here in Vermont, we just put the extra stuff outside!